REELRADIO: The Tom Corbett Collection! "My family headed the Edsel hardtop out west in '63, and along the way I noticed the station ID jingles on KXOK, WHB and KIMN were the same as my hometown station in Indianapolis, Lucky 13, WIFE. That's all it took. I started collecting ID jingles at Ball State University while working at campus station WAGO BossRadio 57. After graduation, I had the opportunity to produce TM's Phase II in Dallas for Top 40 WHUT, Anderson, Indiana, where I was PD and morning jock. 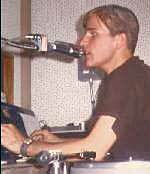 Returned wide-eyed from Dallas thinking on-air work wasn't for me anymore and started a jingle company in Indianapolis, Corbett-Kirby Corporation, with college buddy Mike Kirby in 1972. We produced thousands of commercial jingles for clients nationwide including a 65-episode radio series, The Adventures of Captain Clifford Swish and Wongo, the Norwegian Scab Camel, written by David Letterman. I was recruited by TM Productions in 1977 to direct a television ID division. Left TM (and the industry) in 1984 to become national sales manager for Alcoa's fiber optic division. Today, I own a custom commercial cabinet business in Nashville, CORBETTWORKS. I still avidly collect ID jingles and have a lot of fun in my spare time with the downstairs project studio, Vibra-Sonic Recordings, where 'The Wollensaks make the difference.'" The Repository thanks Tom Corbett for sharing!
. . . Ladies and Gentlemen, I'm not gonna take any more of these crank phone calls . . .
David Letterman (Late Night with David Letterman, The Late Show with David Letterman) is heard in this segment edited from the 11PM -12 Midnight hour on April 1, 1969. WAGO was a carrier-current station at Ball State University. The voice of Lyla Whip is Letterman's former wife, Michelle, who he calls at their apartment. The Pixie was a sleazy 24-hour diner in Muncie that provided an ample supply of grease after a night of drinking and was also frequented by colorful locals. 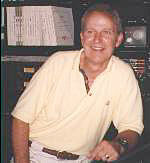 The top-of-hour ID is voiced by Don Worsham of the Media Preservation Foundation. (This aircheck is excerpted from Vibra Sampler One (below).
. . . That's Lemon-Freshened Three Dog Nite . . . This is a 1971 aircheck of Morning Mouth Ed Richards at WIBG, Philadelphia. His roots were at CKLW, but he polished his act and became one of the early "shock jocks" in Philly (although tame by today's standards!) A classic performance.
. . . Thursday . . . Here's thirty minutes of non-stop ID jingle action covering the years 1957 - 1993. VibraSampler One was created not only to salute the legendary PAMS organization, but showcase other producers who also made a significant contribution to the golden years of Top 40 radio. Included is the (previously featured) aircheck of a younger Dave Letterman having some fun on the phone at Ball State University carrier current station WAGO. Special thanks for contributions from: Mark Allen, Mike Bohan, Steve Geisler, Ken Justiss, Mike Kirby, Dave Letterman, Graham Newton, Bob Piper (deceased), John Pizzi, Wally Wawro and Don Worsham. Comments, requests and trades are always welcome, and I would appreciate help with identification of cuts marked with an asterisk (*). Enjoy! All copyrighted material is the property of the copyright owners. We Always Hope There is More to Come from the Tom Corbett Collection!